Forsaken Castle Cainhurst is a location in Bloodborne. Cainhurst is the home castle of old nobles, once actively interacting with Yharnam, most notably as enemies of the Healing Church. They were bound by their bloodlines and by-the-book when it comes to their traditions, before being exterminated by the Executioners, and therefore ending their trades with Yharnam. Now just a cold ruin, Cainhurst has forever lost its road to return home to Yharnam. Only a lake with a deep mist, and dark ominous valleys as far as the eye could see. To get to Cainhurst Castle, you need to find the Cainhurst Summons, found in Iosefka's Clinic from the back entrance via Forbidden Woods. Once you have the Summons, travel to the Witch's Abode (Witches of Hemwick must be dead), walk to the monument by the crossroads and a cutscene will trigger. The cutscene will only activate once the Witch of Hemwick has been defeated. Should you attack the stage coach taking you to Cainhurst after the cutscene it will disappear, re-appering only when you re-enter the area after visiting the hunters dream (or if you die and are re-spawned at the Witch's Abode lamp). Defeat Vicar Amelia and examine the skull on the Altar to change the world state to Night. Enter the Forbidden Woods to access the back of Iosefka's Clinic. Once there, be sure to open the gate that leads to the front of the clinic. Enter the clinic and obtain the Cainhurst Summons. Go to Hemwick Charnel Lane and defeat Witch of Hemwick. Approach the tall stone obelisk in the area with the two Executioners. Annalise, Queen of the Vilebloods - Cainhurst Vilebloods Covenant. Crown of Illusions - On the Ground after the Martyr Logarius boss fight. Executioner's Gloves - same as Knight's Set. Unopened Summons - In the same room as Annalise. It is implied that Queen Annelise and her Cainhurst Knights could have been Vampires, as the ritual of initiation for their covenant is drinking her blood and the Knights vied for the boon of tasting her blood. The Cainhurst Vilebloods were in active conflict with the Healing Church, until they were exterminated by the Executioners. Their conflict began when the Cainhurst nobility acquired something called Vile Blood, that subsequently tainted the castle and the inhabiting nobles, probably turning them into vampires or something similar. They received the Blood from a traitorous student of Byrgenwerth, but consequently began hunting for more Blood amongst the ranks of the Healing Church. Martyr Logarius chose to stay behind in Castle Cainhurst after the Vilebloods were eradicated, since their Queen could not be killed, having consumed enough blood to become immortal. He donned the Crown of Illusions, to forever hide Annelise from the world. Arianna the Whore is wearing a Cainhurst noble dress, hinting at her lineage and forbidden blood. Interestingly there are no male ghosts to be found in Castle Cainhurst, and only the female nobles seem to have turned into ghosts. Cainhurst Castle is by far the most remote location in Bloodborne. It is so far removed that the Blood Moon that hangs over Yharnam is not visible in the Castle, removing it from the sphere of influence the Great Ones have over Yharnam. Queen Annelise states that she and the Player are the only two Vilebloods left, raising the question who or what the Bloody Crow of Cainhurst is. Maria of the Astral Tower could be another descendant of the Undead Queen or the Vilebloods. Her armor set is reminiscient of the Cainhurst Noble set and she seems to be partially immortal, as well as being proficient at blood magic. 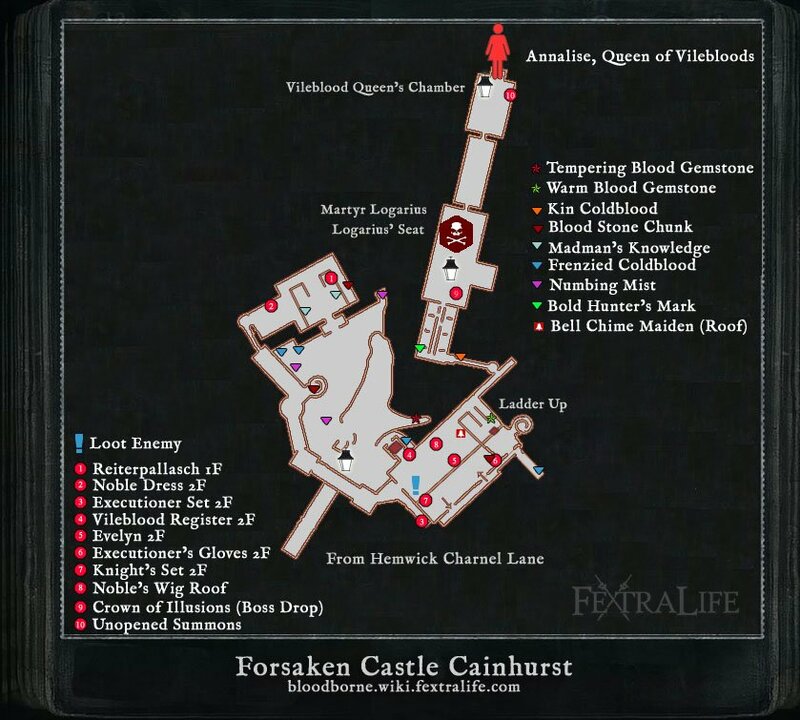 To access Cainhurst Castle, firstly you'll need to get the Cainhurst Summons from Iosefka's Clinic and you need to make sure you've beaten the Witch Of Hemwick boss. Warp to the Witch's Abode lamp and head back towards the large open area. You'll need to clear this area out entirely as if you die before heading to Cainhurst you won't be able to summon the carriage again. So clear out the various Graveyard Hags, Executioners and Tainted Dogs in the wide open area (which is, incidentally, a good farming area for future reference) then approach the monolith by the edge of the path. This will trigger a cutscene as a horse drawn carriage arrives. Get in the carriage and you'll travel to Cainhurst Castle. When you arrive, you'll be on a bridge over a moat with the castle directly in front of you. Your only option is to head forward. As you do the huge gate will open and you'll have the first area lamp. Light it and then get ready for a fight. Over to your right you'll see the access for the first shortcut, but you want to head towards the left and the large gold doors into the castle proper. As you head towards the door you'll encounter three pairs of Bloodsucking Beasts. Fighting these two at a time is very difficult, they're very fast, have an incredible reach and can do a pounce attack that can stun lock you. Try and split them up and then hit them with bolt attacks. Don't forget to pick up the Numbing Mist on the way. If you look down the ravine to your right there is a body with Madman's Knowledge at the end of the path but if you want it, tread carefully as you'll get swarmed by Hateful Maggots if you go down. Back to the main route, when you reach the large doors they'll open by themselves and you'll find yourself in the grand reception area of the castle. There are bodies with items littered around and you'll be able to hear the sound of a woman crying. If you want to, you can pick up the items, but this will cause mobs of Bound Widows to appear and be aggressive. They're not hard enemies to deal with, but in large groups you'll have issues. Kneeling on the floor there should be an Indentured Chevalier. Kill him before he gets up, then head up the stairs and to the left. You'll find another Chevalier on the landing in a similar position to kill him quickly too. In the next room you'll have your first encounter with the Widows proper. As you move around the room you'll see their ghostly outlines and as you approach them they'll become solid and you can attack them. Clear the room out and make sure to pick up the Noble Dress from the chest in the room. Head out of the room and up the stairs onto the castle walls where you'll encounter your first Gargoyle on a round battlement. These enemies aren't very hard but have relatively high HP. Just combo them as they're easily stunlocked and make sure you don't let them grab you. Once the first one is dead, turn around and head up the steps onto a little tower. Kill the gargoyle up here and pick up the Blood Stone Chunk. Carry on down the path across the walls and past another couple of gargoyles until you reach the library. Before you head into the library go right where there are a collection of statues and deal with the two gargoyles at the end of the path so you can pick up the Executioner Set then back track and enter the library. The first thing you want to do in the Library is sprint past any enemies and head to the left into a small room. This is the shortcut back down to the first lamp so you want to trigger this. Return back up and prepare yourself for another big fight. There are several groups of Bound Widows in this area, but most importantly you want to kill the Indentured Chevalier at the far end of the room. He has a blow dart which causes all of the Bound Widows in the area to become twice as aggressive if he hits you (you can tell this by the red mark that glows on the back of your neck if you get hit). Once you've killed the Chevalier and cleared out all of the Widows, head back to the shortcut lift and open the chest to get the Vileblood Register then carry on with the level by heading up the stairs. Up the stairs you have several Chevaliers to deal with. Some appear in pairs but mostly you should be able to clear this area out with relative ease. There's lots of loot in this area so be sure to clear out the enemies and pick up everything you can (see the map below for item locations). Once you're done in the room, look over to the windows and you'll see one with a pane of glass missing. Head outside and you'll be on a ledge. Carefully drop down to the next one, picking up the item off the body, then drop down to the ground. There'll be two Gargoyles here so keep them separate and dispatch them as before. Head through the door back into the library and you'll be met by several mobs of slightly more aggressive Bound Widows, including several that don't hold daggers, but instead hold their own heads and scream at you. The scream can stun lock you, so be careful to kill them first as getting stun locked leaves you open to be hit by the other Widows with the daggers. There is also a Chevalier hiding to the right of the entrance to the room, so prioritise killing him before the Widows as he will use the blow darts to aggro them. In this room there are two chests, one of which contains one of the strongest arcane spells in the game, Executioner's Gloves, while the other contains the Knight's Set. Once you've cleared the room out, you're done in here so head back out of the door onto the balcony. Head to the left as you leave the room and you'll see a gap in the wall with a ledge. Carefully head down the ledge and onto the small roof. Hop into the open window and you'll appear in a blocked off part of the Library. Pull the lever and you'll open up the ladder to the end of the level and create a convenient shortcut back to the first part of the library. Climb the ladder and explore the upper section. There's no enemies up here so enjoy the brief moment of peace. If you head round the side of the room you'll find a Scurrying Beast who holds a Blood Stone Chunk so do your best to catch him. Once you're ready to move on, head up the stairs out of this area to the roof. You'll spot an item guarded by a lone gargoyle. When you engage it, two more will fly in so be fast and damage them as fast as possible. Pick up the Noble's Wig then head the only way you can... off the side of the roof. Don't worry, you can only come off one edge of the roof, so drop off the side and land a few feet down, then look to the circular turret roof, you'll need to walk around the edge of it until you can drop down to a narrow bridge. Head a long here until you find a gap in the fence, drop out here onto another circular roof. Carefully walk around the edge until you get to another bridge you can drop down to. Pick up the Kin Coldblood from the body then climb the ladder. On the next roof, if you head over to the far side and pick up the Madman's Knowledge. Head up the roof and through the archway to take on Martyr Logarius. Once you have defeated Martyr Logarius, pick up the Crown Of Illusions he drops and put it on. Head towards where his throne stood and a cutscene will trigger, causing a previously hidden chamber to appear. Go in the building and up the stairs into Annalise, Queen of the Vilebloods' chamber. Annalise will talk to you as soon as you enter the room, telling you to kneel before her. Walk forwards to just before her and look to the right, here is the Unopened Summons which you need to give to Alfred to finish his storyline (though if you want to join the Cainhurst Vilebloods don't give the summons to Alfred as he will kill Annalise [though if he does, you can take part of her remains to the upper cathedral to have her resurrected. In the event you resurrect her, she will return here automatically]). Kneel before the queen and decide if you want to join the covenant or not. Once you're done, turn around and there'll be another Lamp, allowing you to return to the Hunter's Dream. In the area where you first meet the gargoyle, if you take the raised path to the right and look over the parapet to the landscape beyond there is a lake. In the lake there is an island formation that is a scale model of the island from "Kingsfield", From Software's first game. If you don't loot any bodies inside the castle entrance, the ghosts in that room will not become visible or hostile until you loot an item. Cainhurst has several parallels with the Painted World of Ariamis from Dark Souls. 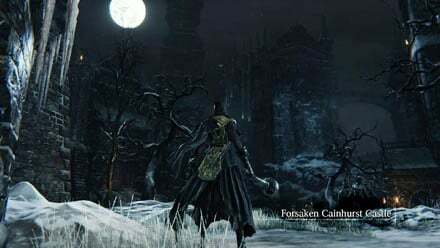 Both are snow covered castles that are situated on an island (Cainhurst surrounded by water, Painted World located surrounded by low valleys), both require that you pick up an item located in the room that you start the game in, the bosses in both areas use a scythe and are humanoids of about equal height, and both wear white clothing.